This place has been making waves pretty much since it opened in the coastal town of Holywood, Co. Down. 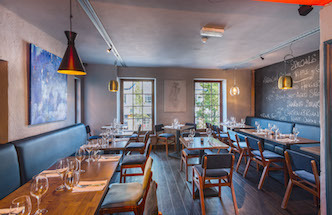 Describing itself as a bustling neighbourhood restaurant, it has impressed the Michelin Bib Gourmand inspectors and well-known food critics such as Jay Rayner from the Guardian. We love it, too especially for its emphasis on great local, seasonal food- often with a Mediterranean twist. Peter Hannan supplies the meat. They get their fish from Still Waters and the vegetables come from North Down Group and Helen’s Bay Walled Organic Garden. Don’t think the prices are out of your reach. They do great Early Doors and Sunday specials for less than £20 for 3 courses. This upstairs premises is decorated in cool greys and blues. The sash windows give great street views. The wine list is constantly interesting and evolving. Just like Noble itself.